The single CAN Interface uses the SN65HVD230 (marked as VP230) CAN driver (IC1) and termination resistor (R4) on the MCBSTM32E board. LEDs PB8 and PB9 are used to indicate CAN receive and CAN transmit activity, respectively. When pin PB9 is configured as input, LED PB9 indicates CAN controller status, When pin PB9 is configured as output, LED PB9 just reflects the status of port pin PB9. 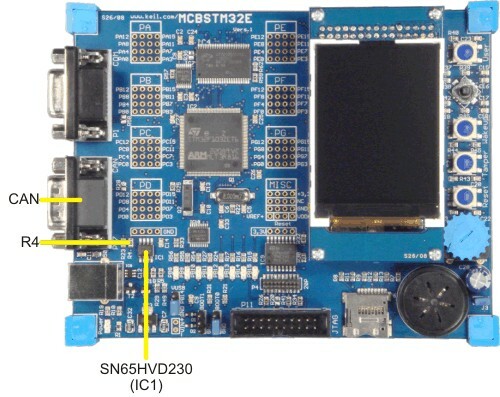 CAN termination resistors make it easy to connect the MCBSTM32E board to your CAN network but they are not always required. When connecting the MCBSTM32E Board to a CAN network, you may need to remove the termination resistor.